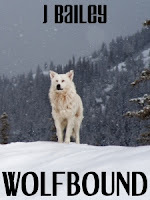 Ana Mardoll's Ramblings: Author Interview: Slactivite Yami on "Wolfbound"
Ana: Today we have our very own Slacktivite Yami introducing her novella, Wolfbound. I haven't read this book myself, but Yami was kind enough to agree to guest blog about their book to any readers who might be interested in the subject. Yami, how would you describe your novel to your prospective readers? In broad terms, what is your novel about? Yami: This is a book for Team Jacob *laughs* No, I'm kidding. It's a sort of coming-of-age story about a young woman named Eileen who moves from California to the UK after a car accident leaves her partially crippled, and a boy named Zachariah who claims to be a werewolf. It's contemporary fantasy, paranormal, urban fantasy, low fantasy, whatever you want to call that odd genre that encompasses both Dresden Files and Twilight. There's some romance, as well. Yami: It's mostly about finding your inner strength, discovering the things only you can tell about yourself. It also touches on what it's like to have an invisible disability, what it's like to cope with being non-neurotypical, and what makes for a good relationship. Yami: I was very lonely while I was overseas; I knew I wanted to use the time to write something, but it wasn't until I was reading the Twilight deconstruction here that the idea began to solidify. In many ways, Eileen and Zach's relationship explores the sorts of unfortunate implications in the Edward/Bella relationship. Ana: I can't tell you how thrilled I am to be listed as an inspiration, thank you. If you could compare your novel to any other existing works, which ones would it be and why? If the one thing you could say to a prospective reader was, "If you like X, you'll love my book! ", which work would be invoked so that a reader could judge whether or not your novel is their cup of tea? Yami: In addition to the connection with Twilight, it also is written similarly to the Kitty Norville books by Carrie Vaughn. Yami: This is my debut novella, but I'm already working on a longer piece called The Hunt (title may change) and am drafting an outline for the sequel. The Hunt will be a lot darker, more like Dresden Files than Twilight, whereas the sequel will focus on a side character from Wolfbound and explore her story in more depth as the overarching plot continues. I'm hoping to get a series out of Wolfbound and a second series out of The Hunt; characters I write never seem to want to leave the spotlight. Yami: It's available now for 99 cents, both at Smashwords and Amazon; more information and direct links can be found at my blog. My blog is the best way to stay informed as well. Ana: Thank you, Yami. I understand you have the first chapter of your novel available as an excerpt for interested readers? And is there anything else you wish to add for our readers? Yami: Wolfbound's excerpt has its own page on my blog. I hope you enjoy it! If anyone is willing to publish a review on their own blog, let me know and I'd be happy to send a free review copy; I'm not concerned with money so much as getting the book out to people who might enjoy it. Oh yeah, and there's a little graphic sexual content in the book, as well as a less-than-healthy relationship, so if that's not your cup of tea, you might want to pass. Do you have the kind of account that would let you change the display name? I managed to get a space between the two names on mine*; you could probably change it entirely, if you've the option at all. *I don't know why I only did that when having a second name is unnecessary in this context, but I haven't bothered to go back and remove it since. I doubt it, what with the whole google+ requiring your actual name and all. Unless Disqus lets you do it? I much prefer using an OpenID to remembering a password, so I just clicked Google way back when I started commenting. Which. Confuses me, because Google has my full name but it only gave up one character of my surname? Which is good, but...? Aha! I figured it out! I had to go to Disqus.com and make a proper account from my former openID-only login. So for anyone confused I used to be 'Bayley G' with no avatar and now am myself again at last~! There was never a Bayley G, only Yamikuronue. Wow, I'm starting to read this now and it's an amazing story that really has an otherkin feel to it! Are you otherkin, or did you know about us before you begin to write this?